Info "‘I don’t care how you do it, but you gotta wake me up!’"
Rude Awakening is one of Tiny Wario's Microgames in WarioWare: Smooth Moves. 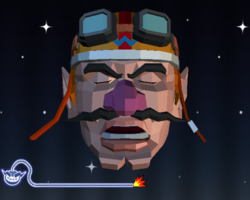 The player must slap Wario's face to wake him up. Even after Wario wakes up, the player can continue slapping him. 1st level difficulty: One slap. 2nd level difficulty: Two slaps. 3rd level difficulty: Three slaps. This page was last edited on February 20, 2018, at 17:49.